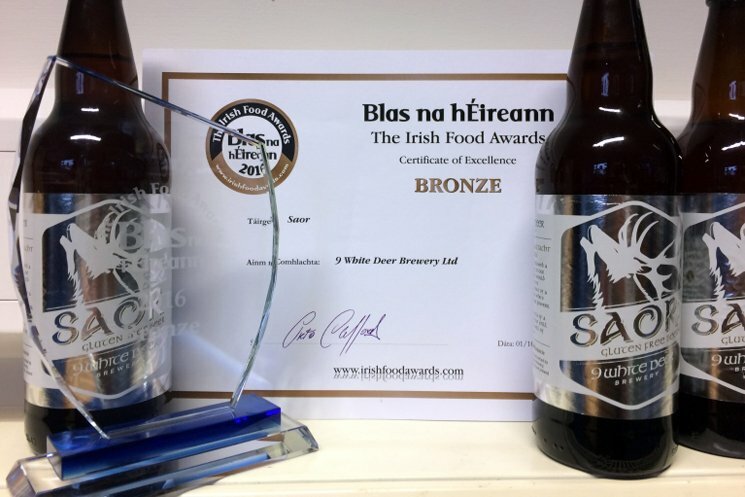 9 White Deer Brewery, Ballyvourney, Co Cork had a successful weekend in this years Blas Na hEireann awards, Dingle was packed with the cream of Irish producers. Saor, a Kolsch Style beer picked up a bronze medal for all of Ireland – Beer and Lager category, this is a big beer award, the fact that Saor is gluten free did not come into play as it is a blind tasting. 9 White Deers aim in creating Saor was that it should taste like beer should, I think it’s safe to say this has been achieved and surpassed. Most gluten free beers are made with Sorghum, millet or another grain containing no gluten, 9 White Deer Brewery re-wrote the rulebook with Saor, it is made from 100% barley and removed the gluten through clever brewing techniques, the first brewery in Ireland to do so. 9 White Deer Brewery was created in 2013 by Gordon Lucey and Don O’Leary, the company now employs nine staff with sales expected to increase significantly next year. While still a relatively small company it continues to punch above its weight with innovative brewing, reflected in the industry awards now collected, last year they won a Gold Medal in the Beers & Ales category for their Black Lightning IPA at the Irish Quality Food and Drinks Awards.